April 13, 2019 | 10:00 a.m. to 3:00 p.m. The Earth Day Festival at the Conservancy is Saturday, April 13th from 10:00am-3:00pm. Admission is $10 for adults, $5 for kids, members and children under 2 are free! 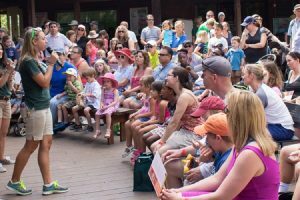 We will have educational and interactive shows led by Conservancy staff and volunteers and a “Super Science Show” with Mr. Glen (Glen Beitmen). Visitors can also enjoy food trucks, music, exhibitors, and vendors throughout the day! There will be a Kids Zone for children to enjoy crafts, activities, face painting, and a bounce house! The Conservancy is located at 1495 Smith Preserve Way in Naples. Explore the exhibits in the Dalton Discovery Center, take an electric boat cruise, visit the animal nursery viewing area at the von Arx Wildlife Center and much more. See more at www.conservancy.org or call (239) 262-0304 for more information.